The classic Santa Barbara Run. 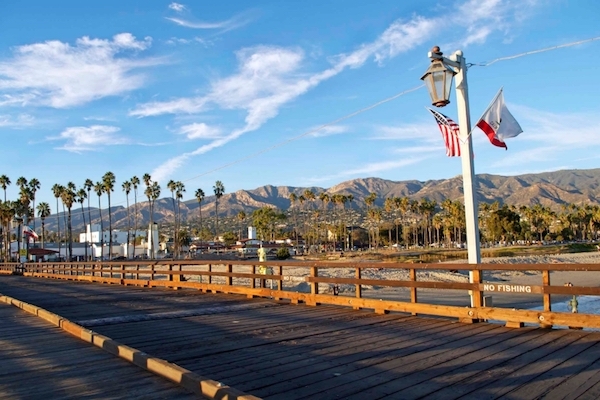 A popular route in downtown Santa Barbara, through the most Instagram-worthy spots in the city: Andree Clark Bird Refuge, the Cabrillo bike path, Stearns Wharf Pier, and Butterfly Beach. The layout of Santa Barbara is incredibly friendly toward pedestrians and cyclists, so runners will have no trouble making their own route through spacious sidewalks and bike paths. You can add or subtract miles as you like, but the route we’ve mapped is bookended by the pier and Butterfly Beach — two don’t-miss attractions while you’re at the waterfront. Start out at the bird refuge and head west along the Cabrillo Blvd. bike path until you reach Stearns Wharf. Take a moment to enjoy the view from the pier before doubling back and heading east across the waterfront to Butterfly Beach. On your way back into the refuge, a number of criss-crossing trails offer return options — so you’ll never get bored! For a longer run or for variety, we recommend continuing along the path from Stearns Wharf to the Santa Barbara Harbor, to Leadbetter Beach and Shoreline Park, about 2 miles one-way. Parallels Shoreline Dr. with a dedicated path most of the way.